Today on Bookcase Showcase I have the lovely author Barbara Mitchelhill author of Run Rabbit Run. In my fabulous office (overlooking fields of sheep and lambs – horray) there is one wall covered with bookcases – all Ikea and very practical with glass doors to keep off the dust. Never had doors before but I love all eight of them. Two shelves contain my own books and glancing across at them keeps me going in difficult days and I say to myself ‘Well, you did have all those books published so how hard can another one be?’ Under these shelves are children’s books by other authors which is a great supply for visiting grandchildren and it’s wonderful to discuss the books with them. Other shelves contain lots and lots of the novels I love to read and books for research, too. I keep the research stuff on separate shelves so that the WW2 reference books which I used for my latest book, Run Rabbit Run, are all on the same shelf and the ones from a different period (top secret) for my current research are on the one below. I have four empty shelves left and these are used for junk of all kinds. But when new books arrived in two and threes, they will no doubt oust these infidels and confine them to the loft. 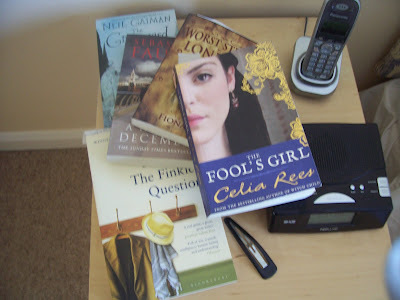 By my bedside, I have a pile of books. Some research, some presents, some impulsive buys waiting for that spare minute. At the moment, I’m reading Celia Rees’s The Fool’s Girl and Sebastian Faulks’s A Week in December. 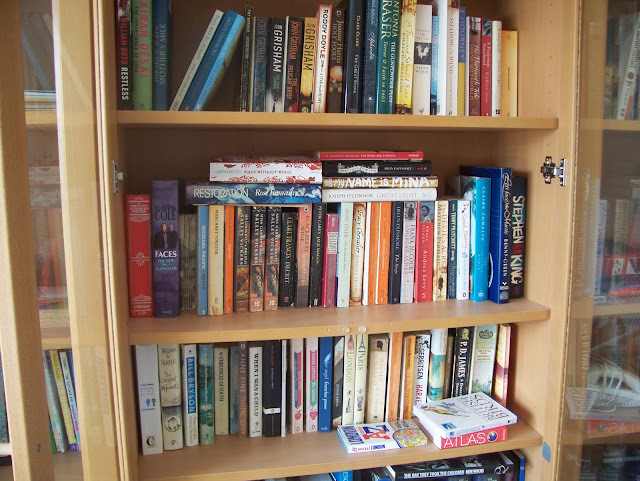 If you would like to be featured in a future Bookcase showcase please see my bookcase showcase page for details of what is needed and where to send it to. Another fab book case Kirsty.